These Instant Pot Cupcakes are made in the style of cardamom pound cake with cardamom glaze and they are going to have you swooning as you take each bite! Moist and buttery, these made-from-scratch cupcakes are reminiscent of homemade old-fashioned cakes your grandmother would have made, with simple ingredients. The cardamom flavor gives the cupcakes a wonderful flavor twist. 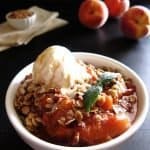 It’s been almost a year and a half since I posted an Instant Pot dessert recipe. That’s not for lack of trying. I’ve made, at the very least, a DOZEN different desserts in the Instant Pot but nothing met my standards. It killed me to waste that time and money but I was on a mission! 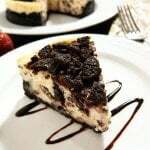 Cheesecakes, lava cake, and puddings including flan and creme brulee are exceptional in the Instant Pot. Cakes, not so much. They tend to be dense and gummy. Cakes from boxed mixes fare better, but I like to make cakes from scratch. 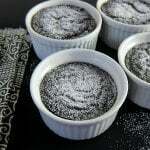 This pressure cooker cake recipe was a completely accidental discovery! I made so many different Instant Pot cakes over the past year and was so disappointed in the results that I was just about ready to give up! 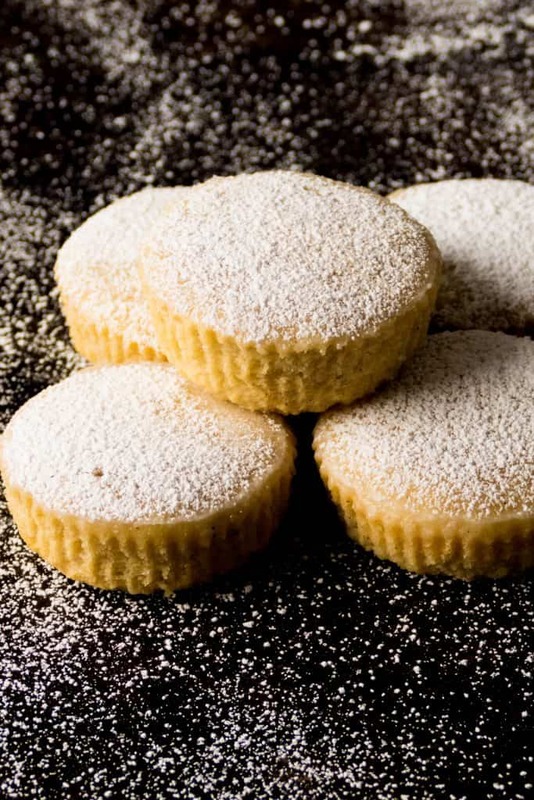 Recently, when I was getting ready to bake one of my husband’s favorite cakes for his birthday, I decided to take out enough batter to pressure cook just one cupcake. Just to give it a try. And guess what? It was really really good!! So began my quest to shrink the cardamom pound cake recipe for the Instant Pot. In the process, I may have gained 10 pounds! But it was worth it – you’ll see why if you try this recipe. So why would you make dessert in the Instant Pot when you can just bake it? Pressure cooker desserts are convenient if you don’t have access to an oven, if you’re craving dessert in the summer and you don’t want to turn on the oven, or if you want to make enough for just one or two people. If you’ve never tried cardamom, you are missing out on one of my favorite flavors in the world! I like to buy whole cardamom pods and powder the cardamom as needed. But you can also buy cardamom powder. If you’re using whole cardamom pods, use the back of a spoon to smash the pod and open it. Take out the seeds and use a coffee grinder or mortar and pestle to grind the seeds into a fine powder. This recipe calls for dividing the batter between 4 custard cups. I’ve also tried it with 5 or 6 custard cups. The more bowls I used, the smaller the cupcakes (and fewer calories!) But I also found that the cupcakes were slightly fluffier and airier. I like to use cupcake liners inside the custard cups for easy cleanup. You don’t need to use the liners; just grease and flour the bowls really well and pour the batter directly into the bowls. Two tablespoons of egg sounds a bit odd but that’s about half an egg which is optimum for this quantity of cupcakes. If you add a whole egg, you’ll get a slightly eggy flavor. I like to use whole milk yogurt in many recipes that call for sour cream. Feel free to use sour cream (traditional, not light or low fat); although I haven’t tried making these Instant Pot Cupcakes with sour cream, I think it would work well. I use my handheld mixer in this recipe but if you have a stand mixer, feel free to use it with the paddle attachment – your arms will be less tired! 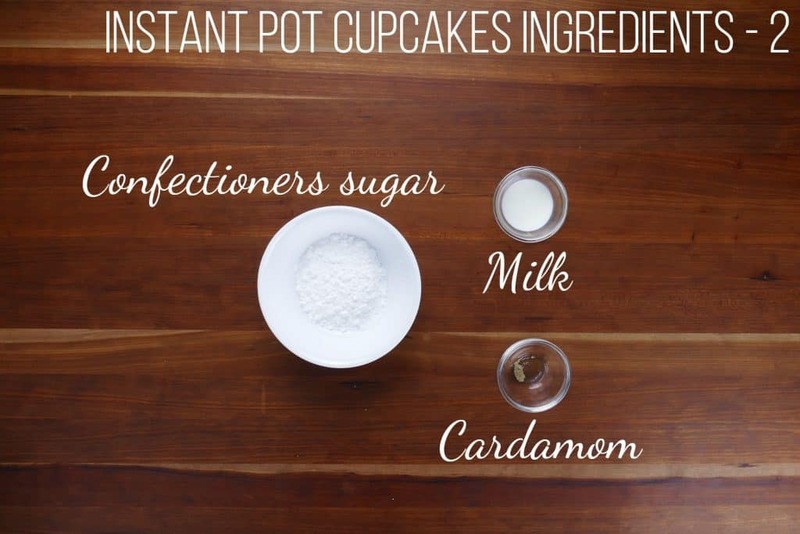 If you don’t wish to glaze the Instant Pot cupcakes, you can dust them with confectioners sugar or omit altogether. I use oven-proof custard cups because of their angled shape that easily accommodates the cupcake liner. You can use other types of bowls like ramekins, ovenproof glass bowls, or silicone egg molds or muffin cups. I have not tried using these containers for this recipe, so you might need to experiment with the cooking time. Beat the butter and sugar till light and airy (about 3 minutes) on medium speed, not high speed. Spoon the flour into the measuring cup and level off with a straight edge spatula or butter knife. Don’t scoop the flour directly from the container. Sift the flour into the butter mixture using a flour sifter or fine mesh sieve. Scrape down the sides of the bowl periodically using a silicone spatula. Incorporate the flour mixture in two or more batches, beating on low speed until combined. Don’t overmix. 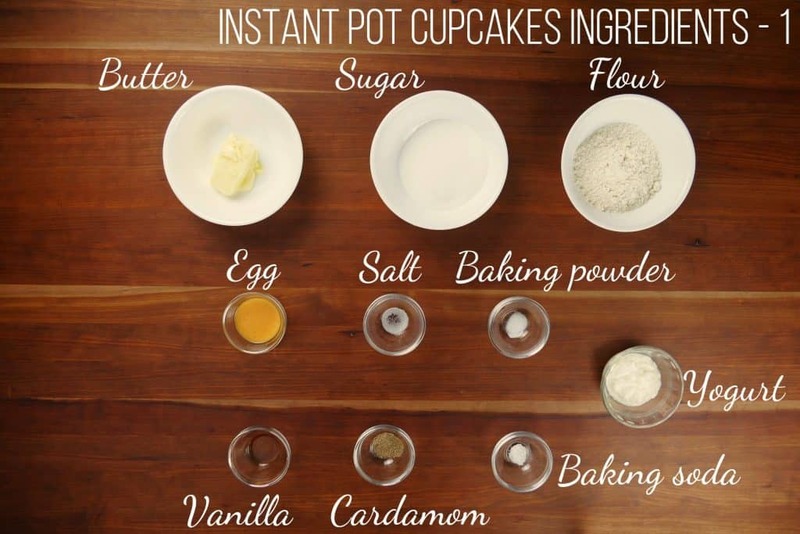 If you’re new to the Instant Pot and aren’t familiar with how to use it, please read the Instant Pot DUO Beginner’s Quick Start Guide or the Instant Pot ULTRA Beginner’s Quick Start Guide first and then come back here to learn how to make these Instant Pot Cupcakes. In a small bowl, whisk together flour, baking powder, baking soda, salt, and cardamom. Use a handheld or stand mixer to beat the butter and sugar on medium speed until light and airy, about 3 minutes. Do not use high speed. Scrape the sides of the bowl every so often using a silicone spatula. Add the egg and beat on medium speed until just combined. Add yogurt and vanilla and beat until just incorporated. Sift in half the flour mixture and beat until combined. Don’t overmix! Line 4 custard cups with cupcake liners. Divide batter amongst the bowls. * You can also use up to 6 custard cups. Your cupcakes will be smaller but a bit fluffier. Add 1 1/2 cups water to the inner pot. Place a trivet with handles in the inner pot. Place 3 bowls on the bottom layer and the remaining bowls on top of them, staggered. Press ‘Manual’ (or ‘Pressure Cook’) and ‘+’ or ‘-‘ until the display reads ‘35′ (35 minutes). Select Pressure Cook mode and adjust the time to 35 minutes (00:35). The display will count down from 35 to 0; it will then switch to ‘Keep Warm’ mode and display ‘L0:00’ or ’00 00′ and begin to count up. Wait till the count-up timer reads 00:10 or L0:15 (15 minutes) and release any remaining pressure manually using the Quick Release (QR) method. This is called a 15-minute Natural Pressure Release (NPR). 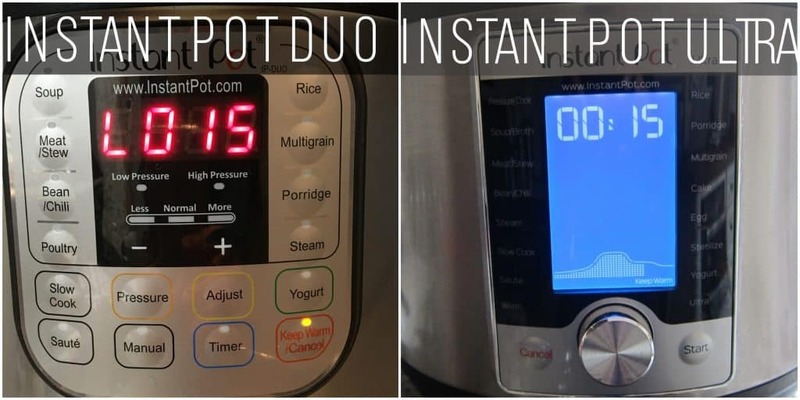 Carefully remove bowls from the Instant Pot. Use silicone gloves if necessary. Place bowls on a cooling rack and remove the aluminum foil. Once cool enough to handle, remove the cupcakes from the bowls and allow to cool on the cooling rack. Right before you’re ready to glaze the cupcakes, stir together confectioners sugar, cardamom and milk till smooth, to create the cardamom glaze. Once Instant Pot Cupcakes are completely cooled, remove cupcake liners if desired. Place a plate below the cupcakes to catch drips. Drizzle the glaze over the cupcakes. The glaze will harden at room temperature. In a small bowl, stir together flour, baking powder, baking soda, salt, and cardamom using a whisk and set aside. 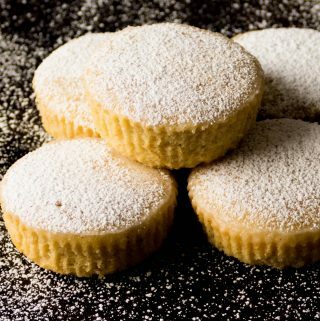 Use a handheld or stand mixer to beat the butter and sugar on medium speed until light and airy, for about 3 minutes. Do not use high speed. Periodically scrape the sides of the bowl using a silicone spatula. Beat in the egg on medium speed until just combined. Beat in the yogurt and vanilla until just incorporated. Use a sieve or flour sifter to sift in half the flour mixture. Beat until just combined. Don’t overmix! Repeat with remaining flour mixture. Scrape the sides and bottom of the bowl periodically. Divide batter amongst the bowls and cover tightly with aluminum foil. Add 1 1/2 cups water to the inner pot and place a trivet (with handles) in inner pot. Place custard cups on the trivet in two rows, staggering them to help them sit properly. Pressure cook on high pressure for 35 minutes and allow for a 15 minute natural pressure release. Release any remaining pressure, open the lid and carefully remove bowls from the Instant Pot. Use silicone gloves if necessary. Once cool enough to handle, transfer the cupcakes from the bowls onto the cooling rack and allow to cool completely. Right before you’re ready to glaze the cupcakes, stir together confectioners sugar, cardamom and milk to create a smooth glaze. Prep time does not include steps that are already accounted for in the ingredient list, e.g. beaten egg, softened butter, etc. See the blog post for more detailed recipe tips, including how to measure the flour! * You can use up to 6 custard cups. Your cupcakes will be smaller but a bit fluffier. I love the flavor of cardamom and needed to try this! I followed your recommendation to make 6 mini cakes and they were perfect. great recipe, thanks! Thanks, Letty! I had a bunch of these cupcakes in my fridge after photographing them and savored every bite!